The Wall of Kindness is an initiative of hanging the winter clothing and other accessories on a wall for use by the poor and needy people. 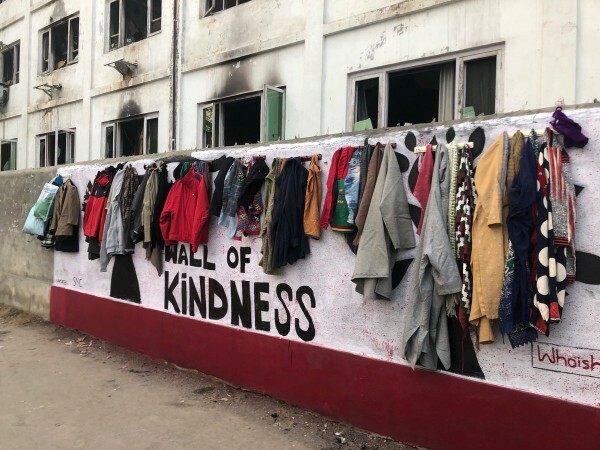 A group of Kashmiri youth have started an initiative, 'The Wall of Kindness' in the summer capital, Srinagar asking people to hang their warm clothes and other accessories to help the needy and deserving ones fight the sub-zero temperatures. On Day 1, when the wall came up, people in Srinagar already showered love for the Wall of Kindness by hanging their clothes. And the initiative has won many a hearts on social media as well. The project originally took off from Iran as Divar-e- Meherbani ( Wall of Kindness) for the homeless people to hang their winter clothing on the wall. The work was appreciated widely on social media and instantly spread to other countries as Pakistan, China, Jordan etc. The idea was of young Iranians who wanted to forge a bond of unity among fellow countrymen at a time when the economy was in doldrums in 2015. In Kashmir, the charity work is an extension of the same initiative trying to help the needy people fight the weather vagaries with the Wall of Kindness. The valley is reeling under sub zero temperatures at the onset of winters. The state administration has resorted to frequent power outages to cater to the increasing demand and thus people are left with only a little means to brave the cold. The economy in the state has been on a downhill hitting the lower income groups and creating joblessness. "Such initiatives are a welcome addition to any society and help promote the unity. We all should actively involve ourselves in such work so as to help the valley overcome the dark times," Muhammad Saqib, an activist said.